New DTE watercooler brochure | Dutch Thermal Engineering n.v.
We proudly present our new DTE watercooler brochure! We hope to serve you even better with a new and improved look and more information on our standard watercoolers. So all technical specifications and other information is now available in this new brochure. 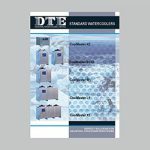 Take a look at the brochure and convince yourself of the quality DTE delivers!